Royal Jelly for my hair! How decadent! I picked up the L’Oreal Elseve Re-Nutrition Night Serum to try because I don’t take much special care of my hair and I felt I should. 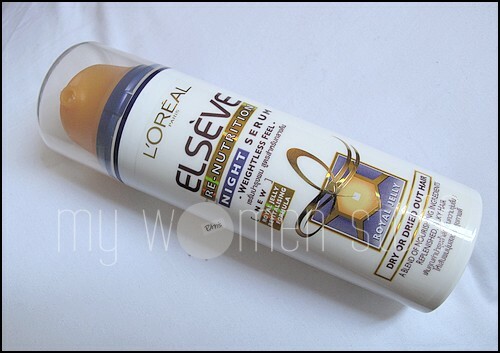 I believe this is a new offering by L’oreal Elseve in the Re-Nutrition range and it promises a weightless feel and is for dry or dried out hair. I detest the heavy textures of leave in conditioners and serums on my hair and I’ve been very wary about overnight leave in hair serums ever since an encounter with Redken Extreme hair serum left me with spots and pimples. I think it just had too much silicone in it. Anyway I must say that as promised, the serum is light to the touch. I pump out about 1-2 pumps in my palm, smear it through my fingers and then run my fingers through the ends of my hair starting from the mid-section. I usually end by running a comb through my hair to ensure the serum is distributed evenly. It dries quickly and does not leave my hair sticky which is another plus. After a little while, I don’t even realise its on my hair anymore. I only use it on dry hair after blowdrying although it says on the back of the bottle that you can use it on damp hair too. The scent isn’t very strong which is something I’m happy with, and this isn’t a detangling serum, but more targeted at keeping your hair soft by treating it overnight. Has it helped my hair? That’s the question right? Well I must admit that my hair has been easy to manage lately and it does not feel as dry or frizzy as it used to. I won’t recommend this one for anyone with oily hair but if you have dry hair, you could give this one a go. It did not cause me to break out, which is again something I’m happy with. On an overall basis, I think I’m quite happy with this night serum and the price of about RM36.90 isn’t exactly bank breaking either as it’ll last a while. Have you tried this night serum? Are you using a leave in serum on your hair? NEXT POST: MWS Christmas Gift Guide & Best of 2009: Spare no blushes! Haha… I don’t have split ends so this works great to keep my hair soft and light. Not sure if they said it would repair split ends? This didn’t work for me at all. haha. Aww… sorry to hear that! yep. i second jyoan. it does nothing, eventhough a put a huge blob half the size of my palm all over my hair and sleep on it overnight. I love this… I used it after blowdrying too at night and wake up to softer and less frizzy hair. I tried the shampoo & conditioner too but not liking them! Yep yep! The non sticky part is what I love best. I liked it too when I first used it but now its just so blah and doesn’t work at all! i’m so glad i found your review page on elseve’s night serum with royal jelly. i was tempted to buy it this afternoon but resisted until i read up on it. i know the price is very reasonable (around 350 pesos here in manila) but after having tried so many products (that pile up unfinished for a number of reasons), the costs add up. can’t wait to leave my own review for this product here!